Find out if you're guilty of a mistake recruiters are catching on resumes. SAN FRANCISCO (AP) — Tech workers in China protesting a corporate culture of grueling work schedules are getting some support from their U.S. peers. SEATTLE (AP) — Looking back at her time as an early Microsoft employee, Melinda Gates said the brash culture at the famously tough, revolutionary tech company made her want to quit, but that she didn't discuss it with her boyfriend, and later her husband, Bill Gates, the company CEO who embodied that culture. Microsoft is under pressure to defend a campaign against long working hours at Chinese technology companies from censorship after it was blocked by a number of companies. Tech companies are about to hit competition they can’t shake: Their slightly younger selves. Get ready for the phrase “tough compare” to be muttered by dozens of executives and analysts as earnings season hits high gear this week, because growth was so strong in 2018 that 2019 is bound to look bad by comparison. The first quarter for tech is often slower after the holiday rush, but not last year, when semiconductor companies flourished selling suddenly scarce memory and crypto-mining chips and profit was easy to find even in the famously profit-averse internet sector amid the tax-cut windfall. Microsoft's (MSFT) third-quarter results are likely to benefit from enterprise strength, robust Office 365 & Azure adoption. Dow Jones futures: Earnings reports will tackle key stock market questions this week. Can chips keep running and software rally? Will Facebook grow? How costly is the Boeing 737 Max mess? So far 2019 has been spectacular for Cisco Systems (NASDAQ:CSCO). Cisco stock has risen 30% this year. That's the best performance in the Dow Jones Industrial Average, narrowly ahead of Apple (NASDAQ:AAPL). Among the 27 stocks with a market capitalization over $200 billion, only Facebook (NASDAQ:FB) has outpaced CSCO stock YTD.Source: Shutterstock The optimism makes some sense. Cisco's legacy networking business long has struggled with growth, but the company is shifting into areas of better growth. It's becoming more of a security play, giving it exposure to that hot sector. Growing recurring revenue from increasing software sales add to the case, and 5G offers yet another catalyst for Cisco stock.Again, the optimism here makes some sense. Indeed, I laid out the potential bull case for CSCO ahead of its fiscal first quarter report. But with Cisco stock up 25%+ since then, the concern is that even that bull case now is priced in.InvestorPlace - Stock Market News, Stock Advice & Trading Tips * 5 Dividend Stocks Perfect for Retirees The Cisco Stock RallyFrom a broad standpoint, there are four key drivers of the big gains in Cisco stock. First, the company's Catalyst 9000 switches have launched well, driving double-digit revenue increases. For a company that has struggled to increase sales (fiscal 2018 revenue was basically equal to FY16 levels) the new product is welcome, to say the least.Second, Cisco is adding more software to its legacy hardware products, including the Catalyst switches. That shift improves margins and adds the recurring revenue tech investors seek these days. It also allows Cisco to continue to monetize its hardware after installation, instead of receiving just a one-time sale.Third, the company continues to move into security. Like more focused players like Palo Alto Networks (NYSE:PANW), here, too, Cisco has built out its software offering instead of focusing on just hardware. Cisco has integrated its SD-WAN products with cloud-based software, which drove double-digit growth in the second quarter.Finally, 5G is on the way, and that represents a real profit driver going forward. The adoption of that technology should help revenue, but Cisco already is investing in its development at the moment, meaning incremental costs should be lower.Obviously, there are other factors at play; this is a company that generates revenue of roughly $50 billion a year. These areas are where Cisco has an edge and an opportunity to accelerate revenue growth. Smaller rival Juniper Networks (NYSE:JNPR) hasn't had the same success, and while CSCO stock has soared, JNPR has been flat for basically four years now. Cisco's moves explain much of the outperformance of its stock. The Concerns with CSCO StockIn sum, the moves make Cisco sound a bit like Microsoft (NASDAQ:MSFT) earlier this decade. 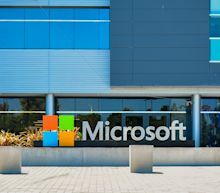 Microsoft had similar growth questions, and relied on a legacy market (personal computers) that seemed to have little room for growth.Then new businesses like its Azure cloud platform, a go-to-market change for Office and Windows, and smaller efforts in gaming and hardware have dramatically changed the story. MSFT has more than quadrupled since 2013, thanks to earnings growth and multiple expansion.That said, there are two concerns here. The first is whether the Microsoft model actually is in play here. While there are growth opportunities going forward (perhaps most notably in 5G) the legacy business still is flat, if not shrinking. Security was just 6% of revenue in fiscal 2018, according to figures from the 10-K. Cisco itself is guiding for just 4-6% revenue growth in the third quarter.Growth might be improving, but it's not exactly torrid and certainly not yet. Meanwhile, Cisco stock's big rise has notably changed its valuation. As recently as last year, CSCO was pricing in basically zero growth.Now, Cisco stock trades at over 18x FY19 consensus EPS. Even with the Street projecting 10% growth in FY20, that's not a hugely attractive multiple. It suggests, at the least, that Cisco's recent success will continue for years to come. And it's worth noting that Cisco stock now has outrun the average analyst target.To be sure, that doesn't mean CSCO's run is definitely over or that the stock is a sell. Strong Q3 earnings, likely due next month, can lead those estimates and price targets up. The advent of 5G probably starts contributing next year, and its growth won't end any time soon.Still, the upside looks thinner, and Cisco really can't stumble back at a high-teen P/E multiple. Investors sticking with CSCO at this price had better be sure the transformation will continue.As of this writing, Vince Martin has no positions in any securities mentioned. More From InvestorPlace * 2 Toxic Pot Stocks You Should Avoid * 5 Dividend Stocks Perfect for Retirees * 7 Reasons the Stock Market Rally Isn't Over Yet * 10 S&P 500 Stocks to Weather the Earnings Storm Compare Brokers The post After an Impressive Run, Cisco Stock Is Starting to Cool Off appeared first on InvestorPlace. First-quarter revenue at Huawei rose 39 per cent from the previous year to Rmb179.7bn ($26.8bn), an increase that suggests US efforts to persuade countries to ban the Chinese group’s telecoms equipment from their 5G networks have not tempered growth. Washington’s bid to sway other countries to join it in blocking Huawei on the grounds the company’s equipment creates a security risk has only been partially successful: while Australia and Canada have joined the US in blocking Huawei kit, several European countries have rolled back on initial hardline stances. Quarterly results on Monday indicated a minimal impact on Huawei’s finances. These are the next generation's Dividend Aristocrats. What is Express Logic, and why did Microsoft just buy it?